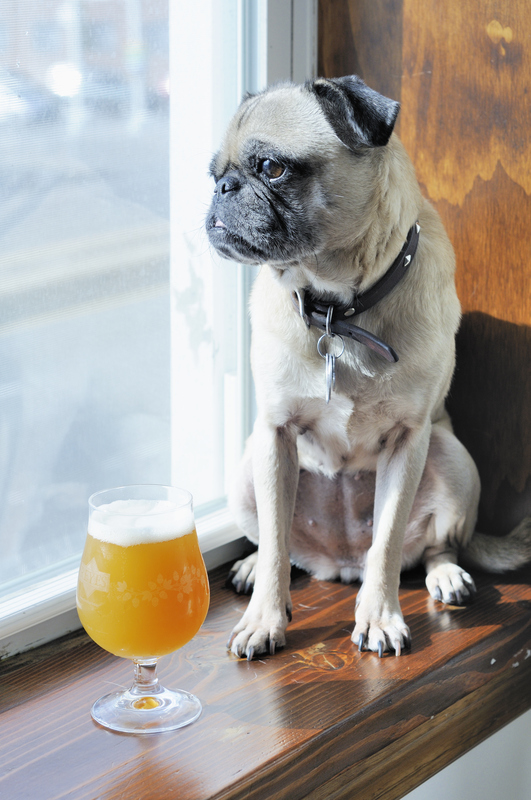 Brewhouse pug Daisy striking a less-than-impressed pose. Single Tap is my constantly evolving attempt to brew what I consider to be the perfect IPA . I’ve now brewed iterations of this beer on four different occasions. The recipes have constantly evolved, converging towards a unified goal – making an extreme IPA where the process and recipe are tuned to produce the brightest and most intense hop aromatics possible. I question whether any beer, commercial or made at home, can ever be hoppy enough to satiate the most extreme hop heads. This is my attempt. Let’s talk strategy. The more times that I’ve brewed this, the more I’ve realized that it would be difficult if not impossible to over-attenuate a beer like this. The drier I’ve pushed this beer, the more easily I’ve been able to get the hop aromatics to jump to the foreground. This beer went from 1.072 to 1.012 — 83% apparent attenuation, and could easily be pushed a bit further. Copious additions of simple sugar and low mash temps are key, and produce none of the oft-cited negative flavors that many brewers attribute to brewing with sugar. The grain bill derives a touch of malt complexity through the use of lightly kilned base malts (Vienna) and a token addition of low lovibond crystal. The malt character should be in the background and provide a clean backdrop for the hops. Hopping levels in this beer are a bit absurd and dramatically loaded to the back-end whirlpool. In selecting the hop varieties, I focused on tropical fruit-forward hops. I’m not a huge fan of the more resinous/dank IPAs out there (like Stone Ruination), so I avoided certain hops like Columbus, Simcoe, and Chinook which can be a bit abrasive. During the boil, there was a small addition at the beginning to help keep the kettle foam down and lay down a low base of bitterness. The amount of bitterness required to balance this beer is minimal due to the low residual sugar levels. The key is obtaining nearly all of the bitterness during the whirlpool rest, which has the added benefit of imbuing a high level of hop flavor and aroma to the beer. Once kegged, I treat the beer with a huge dry hop. I tend to limit the contact-time with dry hops since I’ve found that only bad flavors (grassiness) are gained after day three. It is important at this stage to thoroughly flush the vessel you’re dry hopping in with CO2 as oxidation in hoppy beers can seriously impact the life of the beer. Pitch yeast once beer is at 62°F. Keep beer at 64°F during the start and peak of fermentation. Slowly raise to 70°F as signs of fermentation taper off. Soft NYC municipal water with 6g Gypsum and 3g Calcium Chloride added to the mash. This is quite possibly the hoppiest IPA I’ve ever stuck my nose into. The intensity of the hop aroma could very well have surpassed the limits set by the best commercial hoppy beers out there. Huge amounts of tangerine-like citrus, mango, and sweet orange jump from the glass. The hopping levels exceed the levels described in the BJCP guideline which currently doesn’t reflect the intense aromatics found in the best examples of contemporary IPAs. A low bready malt character is barely apparent behind all the hops. The beers pours a light golden hue with a high level of murky hop haze. A fluffy white head forms and easily persists to the bottom of the glass. This is not a pretty beer… and I’m okay with that. The hop bombardment carries through to the flavor, leaving only just a hint of any malt behind. The hop flavor fills your mouth with intense fruit flavors and a hint of pine resin. A touch of grassiness was apparent when the beer was initially kegged, but eventually dropped off as the beer aged out. A bit of warm alcohol is apparent and reminds me that this beer pushes the alcoholic boundaries for a standard IPA. The bitterness is medium high and lingers a touch in the finish, along with a huge amount of hop flavor. Very dry malt, with fruity hops giving a slight impression of sweetness. Somehow this beer manages to feel dry and round at the same time. My suspicion is that the hop oils contribute a beautiful silky mouthfeel. This beer goes above and behind the levels of hops that the BJCP describes for American IPAs. That said, it truly reflects contemporary examples of the best IPAs currently produced in the commercial craft market. The beer is dangerously quaffable. A world-class hop delivery vehicle. This entry was posted in Homebrew Recipes, Homebrew Tasting, Homebrewing and tagged ale, american beer, beer, homebrew, homebrewing, hops, ipa, recipe, review, single tap ipa by Nick Ladd. Bookmark the permalink. Hey Nick I actually brewed a German Pils the day after I brewed your Northern English Brown. I used a Hop Rocket with 1 oz. Hallertau and 11 gallons of wort. Are you still using ~0.7 gal as the amount of wort leftover in the hopback? I am getting about 1 gal. leftover in my lines, etc. Also, do you pull everything out of the boil kettle (trub and all) when you use the hop back? Yeah, 0.7 gallons is about right on my system. I usually pack the hops in there pretty tight (3 oz or so) which will take up some of the volume that is left in there. I just let everything go into the rocket and count on it acting as a filter before the wort gets to my plate chiller. It’s pretty effective in my experience.